Start with a quick demonstration, artfully compiled by google auto-awesome. What this project covers is how to control RGB (red green blue) LED lights from a PC through your existing WiFi network. To do this, you need a few items; you can get started with controlling RGB LEDs for less than $100. A power supply. Start with a 12V 2A DC transformer of some sort. I've used old laptop and router power supplies. I'm still learning about the engineering here, but my understanding is more amps means you can power more lights. But there's a limit; there is a voltage drop over the length of the light strip and at some point the power will need to be refreshed if you're going to power a lot of lights. And I'm not sure about the load capacity of the LED controllers. RGB LED lights. I like LED tape due to its versatility. It has a sticky backing that'll adhere to most surfaces. You can get it with varying degrees of weather ratings. And finally, you need a controller. I've used two types. don't get this one; the rest of this guide will only cover the next one. yup. much better. get that one. If you got the power supply we recommended above, you need to know a little bit about electrical wiring to hook it up. What I did was cut the end off a PC power cable to expose the raw wires, which will need to be connected to the screw terminals. Black is line (L - screw 9), white is neutral (N - screw 8), and green is ground (screw 7). Screws 1, 2, and 3 are V+. Screws 4, 5, and 6 are V-. You need to connect one V+ and one V- to your WiFi LED controller. 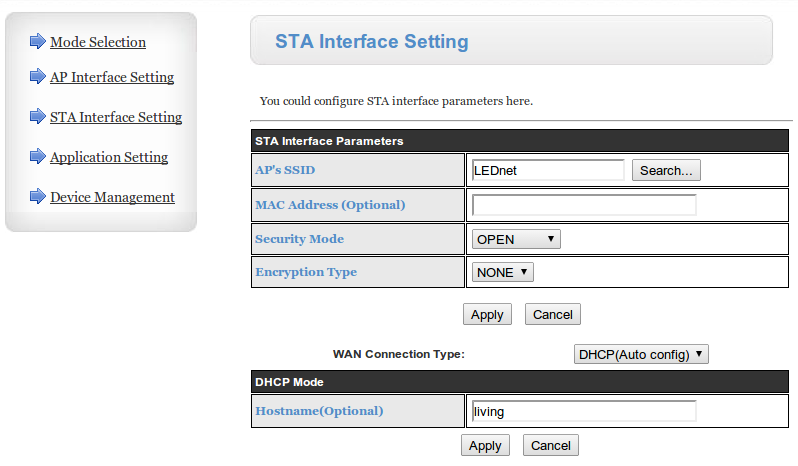 Setup the STA parameters according to your existing WiFi LAN. Setting these parameters will make the LED WiFi controller available on your network. I broadcast a special SSID called LEDnet just for these adapters; my WiFi infrastructure (UniFi), enables multiple SSIDs with client access rights. It's off-topic, but I highly recommend UniFi. Hide the SSID in the AP settings section. I would disable it altogether if it provided the option. When it's on your network, there's no reason to let it continue broadcasting a rogue signal. At least by hiding the SSID it won't be visible. Set the mode to STA. I would've expected this to disable the AP interface, but it doesn't. I suppose it's a bug in the firmware. var Office = '10.1.1.65' //IP of the LED controller. var Living = '10.1.1.66' //IP of another LED controller. //This message gets sent to the controller when the socket connection is established. //The controller won't accept any other messages until you send this once. //Here we create an object for one set of lights. //And here we create the same object for another set of lights. * continually fade the lights through a color wheel. * values of the colors array. var color = 0 //global variable marking our position within the colors array. var brightness = 100 //global variable indicating the dim level as a percentage. writeToLight() //DRY communicate with the lights. * are expressed in decimal as 0-255. * Each command starts (the STX value) with a value of 86. * Each command ends (the ETX value) with a value of 170. //If the state isn't ready, we lost our socket. Try to reconnect. //Right arrow key was pressed; cycle forwards through the colors. //Left arrow key. cycle backwards through the colors. //up arrow key. increase the brightness level. //down arrow key. decrease the brightness level. //we don't know what key was pressed. //uncomment the following to log the keypress so it can be implemented. //This is the continuous interval that constantly changes the lights.